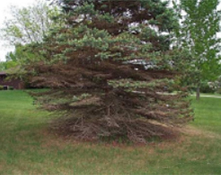 Blue Colorado Spruce is the primary host. Norway Spruce is resistant. Other spruces and pines are infrequently attacked. 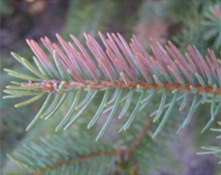 Symptoms of needlecast appear between early spring and early summer when needles infected the previous season turn purple or lavender. By mid-season, infected needles drop, leaving only current season growth. With a hand lens, you can see rows of black specks on the needles, where the pycnidia have emerged through the stomates of the needles. These black fruiting bodies are diagnostic of infection by Rhizosphaera. Healthy needles have white stomates. The fungus lives inside the needle tissue, producing pycnidia that emerge through the stomates. Spores are released throughout the growing season during wet weather. Symptoms usually appear in the lower part of the tree first and progress upward. Older inner needles show symptoms first. 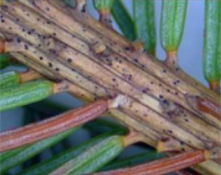 Needles may first develop yellow or red speckles or blotches before turning brown or purple. Needles drop off the tree. Most infection occurs on mature needles in May and June during wet weather. Do not prune trees when foliage is wet. Disinfect tools after pruning diseased branches. Apply first treatment of fungicide in spring when new growth is half grown (1-2 cms long). Repeat at 3-4 week intervals when needles are fully grown. Preventative fungicides may help if the disease is not too severe. Do not crowd plants. Maintain adequate sunlight and good air circulation. Improve air circulation through pruning and proper plant spacing.